Now that fall is here, have you got your bird feeders up and running again? Or maybe you feed birds all summer long. In either case, its both personally gratifying and valuable to science to keep records of the birds you see at your feeders and in your yard. We hope you will send your records to Westford Wildlife Watch of course, and also you may enjoy joining Cornell Laboratory of Ornithology’s Project Feeder Watch. If you join the approximately 300 Massachusetts residents who are already Project Feeder Watch reporters, you can send in your reports online, see what other reporters are observing, and help out the cause of citizen science. Checking the Feeder Watch website, one can see the birds which were reported from all states and years. For the Massachusetts 2016-2017 season, we can see that 90 species of birds were reported. Most common birds reported were the usual suspects, Black-capped Chickadee, Tufted Titmouse, Blue Jay, Dark-eyed Junco, Downy Woodpecker, Mourning Dove, Northern Cardinal and White-breasted Nuthatch. These resident birds were reported in 80-90% of sites during the entire season. Some of these birds, such as Blue Jay and Black-capped Chickadee represent a welcome come-back from West Nile virus which ravaged their populations a few years ago. American Crow, that was hit hardest by the virus, has had a much slower come-back, and is still only seen at about 25% of sites. Some statistics are surprising. For instance, we think of Wild Turkey as practically ubiquitous in Westford yards, but it is only reported in 8-17% of Massachusetts sites. Carolina Wren, a formerly southern bird, but one we think of as a common resident now, is reported from only 20-23% of sites. American Robin, which we think of as an overwintering bird now, is still seen mostly in the spring when 59% of sites report it. In the winter, only 10-15% of sites report robins. The same pattern is seen in Eastern Bluebirds, which are seen at about 19% of sites in the spring, but only 4-8% of sites in the winter. 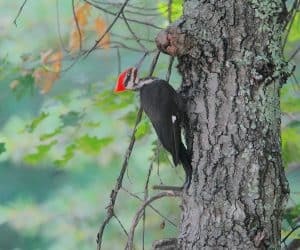 Some birds are reported only rarely, such as Pileated Woodpecker, reported from only 1-3% of sites. These statistics make interesting reading, and make one eager for the upcoming Feeder Watch season. Yes, participating in Project Feeder Watch, can even make you look forward to winter! If you’d like to join Project Feeder Watch, simply log on to their website, feederwatch.org, and click on “join”. You can also read all the information on this great site without joining. Many thanks to all flora and fauna reporters for the month of September. Please send reports by October 26, for inclusion in next month’s column. You can write me at 10 Chamberlain Rd., call me at 692-3907, or e-mail me at mariancharman@verizon.net. Dot Mooney, Monadnock Dr. August 25, Carolina wren around, six chipping sparrows eating seeds–cute little birds. August 27, a wood pee-wee calling from back woods. The fruits of the row of sumacs along edge of woods are deep red now, later in winter, when food is scarce, some birds will begin to eat them. August 29, flicker’s shrill call from nearby woods. Female hummer busy visiting potted flowers. Two house sparrows have joined the family of chipping sparrows eating seed. August 31 at Howard Rd. wetland, numerous painted turtles, last of the purple loosestrife and St. Johnswort blooming , soft plumes on the tall reeds getting larger. At Beaver Brook Rd., a family of mallards on pond side, along with the family of five swans. The three youngsters getting quite big. On the other side of the road one adult swam alone, a newcomer. Blue chicory running out of blooms. Barbara Theriault, August 27, blue heron standing in middle of Grassy Pond. Doug Pederson, Woodland Dr. September 1, pileated woodpecker landed in a tree just above where I was sitting in my yard. Coopers hawk here chasing the crows. Now I have a tamed crow who sits outside my door for food, waiting there as early as 6 a.m. Also, I feed all the birds at my five feeders, a rabbit that has been around here for a number of years, turkeys and many squirrels. At Beaver Brook, swan family of five, six mallards and a family of six or more wood ducks. Dot Mooney, Monadnock Dr. September 4, chickadees and titmice, taking turns in bird bath out front. Lots of small bumblebees visiting hydrangea, hummers still coming to potted plants. September 5, goldfinches on feeder, then they came to pots of coneflower on front walk. September 7, a flicker robing holes in grass by front walk. Five doves on ground under bird feeder. Two female hummers arguing over a hanging impatiens plant. September 8, sat on front step listening to a lively conversation between two white-breasted nuthatches. One male goldfinch taking sips from bird bath, several turkeys wandering around near feeder, five doves on back lawn. Four downies on deck taking turns at suet. September 10, three house finches in bird bath together, water going everywhere. September 14, another long conversation, this one between three flickers. September 17, small cooper’s hawk again swooped low, just missing doves on ground under feeder. Colors slowly beginning to change– vines first, then the wetland shrubs and on to the trees, a beautiful process that we can take the time to enjoy just by looking out the window. Where did the summer go? Leslie Thomas, September 5, a bear sighted on Groton Rd., coming in to Pilgrim Village. Buffie Diercks, Depot St. September 7, four young bobcats playing in my backyard last week [Buffie sent a video of them-MH]. Gute Fernandes, on Russell’s Way, September 7, spotted salamander crossing the road. Len Palmer, Colonial Dr., September 9, two deer and twenty or more turkeys in front yard at the same time today. The deer are eating my lilies and the turkey are wiping out this year’s wood frog young. Marilyn Day, September 22. At Stony Brook, fishermen catching nice sized large mouth bass and lots of pickerel. At Graniteville Rd., a cuckoo heard around the yard recently. Diane Duane, at Grey Fox Lane, September 23, monarch butterfly. At Haystack saw another. This must be the last (4th) generation that will be migrating south. Debbie Prato, Hayrick Lane, September 24, Canada geese, mallards, woodchuck, grasshopper sparrows, dead Northern leopard frog in street.